The FSRI extends its best. Sure these are tough economic times, and maybe in this tumult of free-falling finance you've managed to find yourself out of a job and on the street. DON'T SWEAT IT!, claims the FSRI. With failure comes opportunity! Before you go home and drown yourself in sorrow, stop in at the nearest internet cafe and GET TO WORK! The internet has become a marvelous tool for job searching in our modern business climate. Through the internet you can access newspaper classifieds, submit resumes to job-finding databases such as Monster.com or Google and go directly to company sites where job-postings are readily available. In no time you may find another job waiting for you just around the corner ...and all it took was a few minutes surfing the web! If weeks have gone by, however, and your job search has led you to repeated dead ends the FSRI recommends that you consider this option: start your own internet, job-search company! It may come as a surprise, but many successfully employed people obtained their employment through starting and building successful companies of their own. And what better situation could you wish for? ...you're an employee of your own company (i.e. you're working! ), you can join in all the thrills that owning and operating a business provides, and, if worse comes to worst, you've created and managed a great platform for finding new work whenever you need it! BY CREATING AN ONLINE JOB SEARCH COMPANY, YOU CREATE A JOB OF YOUR OWN! Remember, owning and operating a company is not simply a matter of obtaining a business license and then watching as the revenue pours in. No. There's all kinds of stuff you have to do, like making sure other employees don't fight during business hours and keeping poachers out of your parking space. But if you stick with it, you're sure to excell! When you're following the Faking Smart! advice we give you, you have no choice but to succeed! Now on Kindle for only $0.99! Famous writer, entrepreneur and business self-help icon. For many years now the FSRI (the Faking Smart Research Institute) has encouraged me to blog as a way of disseminating some of my more current theories of Faking Smart! This blog is that blog. 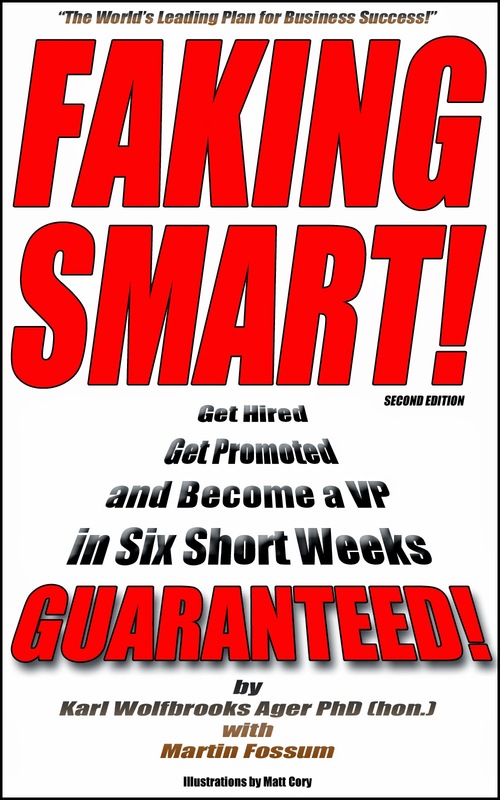 If you wish to learn more about Faking Smart! you should click on my web-page link. Also, feel free to contact me through my profile. For disclaimer information scroll to the bottom of this page. Just as nothing in life should be taken seriously, neither should you take seriously any advice given in this column. If you choose to follow KWA's advice any reversal or betterment of either your monetary or psychological condition should be judged purely accidental and not the responsibility of either KWA, the FSRI or any of the Faking Smart! programs. Advice is cheap these days, so cheap in fact that it should ignored and considered worthless. We at the FSRI, therefore, suggest you take anything here at face value.